My daughters couldn't stand it anymore. The sun was shining, snow was melting, pavement was showing—why, it's practically summer. 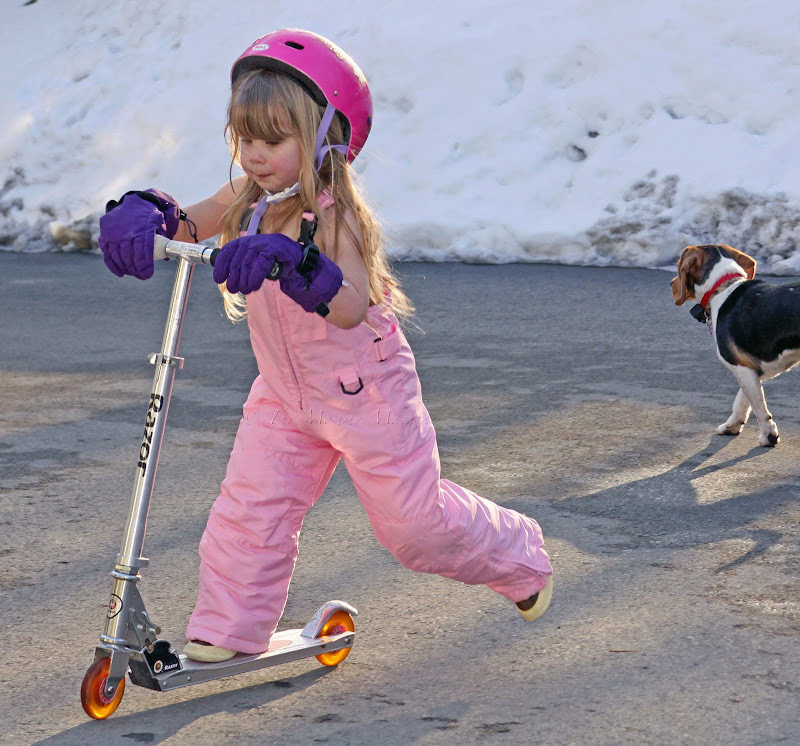 The girls grabbed their rollerblades, scooters, and skateboard, and hit the driveway. Sometimes literally. Remember roller-skating at the rink to disco music? Now it's roller-blading outside while listening to Lady Gaga on your iPod. My 9-year-old can't be stopped. 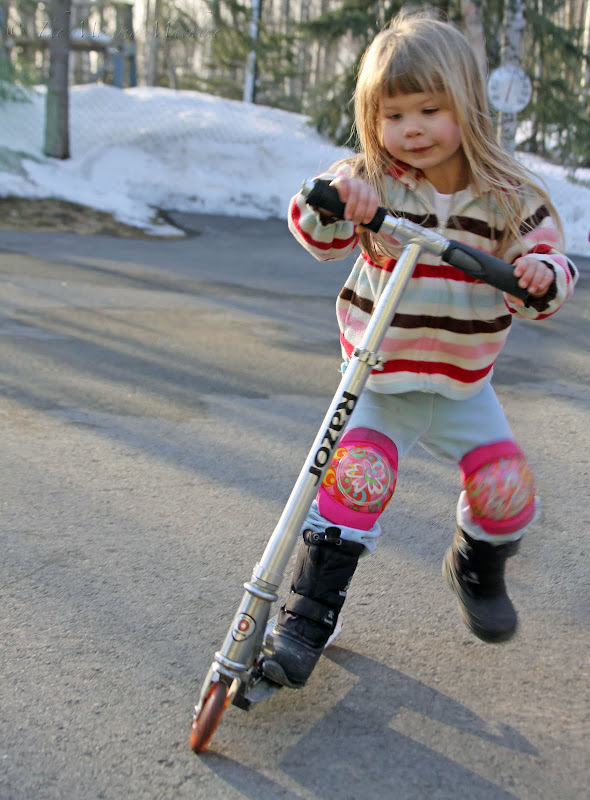 First, the pogo stick. Then the ice skating. Lord, have mercy, now she's teaching herself to skateboard. This kid feels the need for speed. Watch out, Daisy Dog. She'll run you over. Oh, dear. I've seen pictures of little country children running around barefoot and shirtless in their denim overalls . . . but what kind of horrible mother lets her daughter wear oversized gloves and play shirtless in her snowbibs? 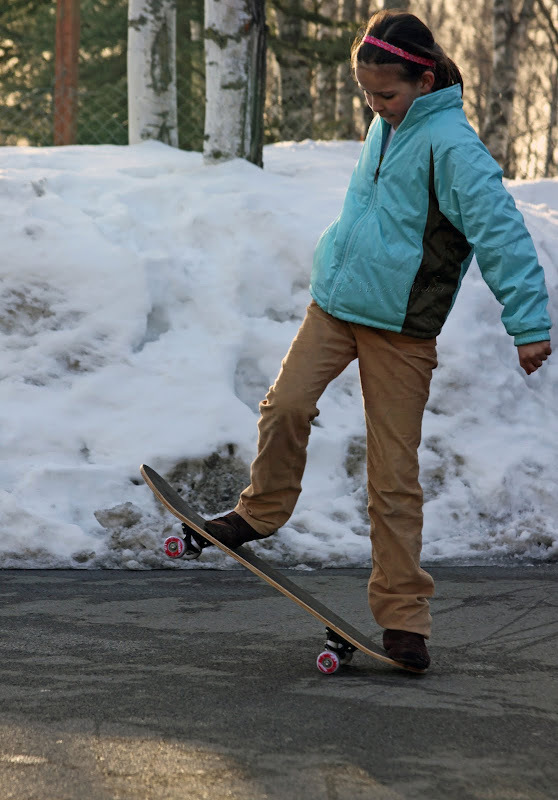 We bought my stepdaughter all the gear for skateboarding...and she tried it for about a week and decided it was "too hard." Looks like your daughters had a ton of fun this weekend playing outside. NC is probably experiencing summer weather from an Alaskan perspective! Well, at least she has a helmet. It's so great to be outside again, isn't it. I still don't know how to rollerblade...looks scary! Well, at least you thought to put a helmet on one kid and knee pads on another kid. You already got that going for you!! 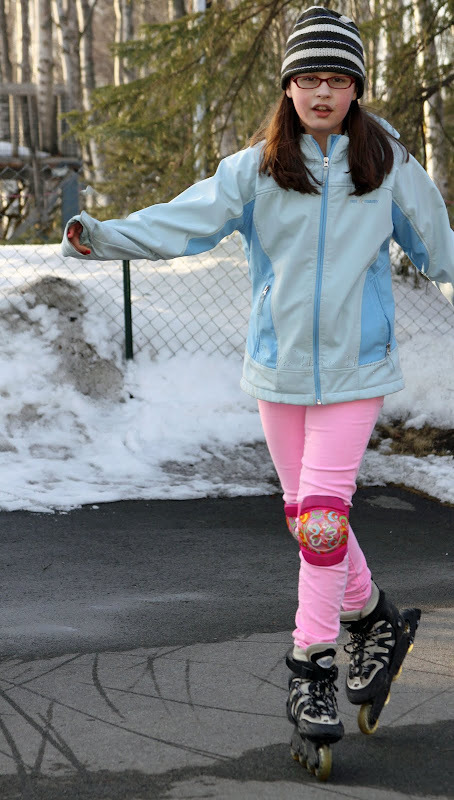 The pictures are amazing...I can't believe one of your girls is teaching herself how to skateboard!!! I don't think I'd even have noticed she didn't have a shirt in that pic, but since I did - what were you thinking? Looks like that was some pretty extreme razor scootering. Makes my daughter's low speed, "I'm doing it!" scooter attempts look pretty lame. I won't tell her. That looks like a lot of fun. The only thing I miss about Winter is the joy of Spring's arrival. Oh that is CLASSIC. What a perfect moment to capture! All of them. Yes, our Alaskan children will take whatever crumbs fall their way, in terms of weather, dry pavement, or spots of encouraging sun. I love it. I LOVE that your girls get outside to actually Play! I would have to tell my kids, your grounded go outside! Seems Mi got a little carried away with "organized sports" and video games creating an entire generation of kids who didn't know how to play. I love these pictures!